Patrick White is still Australia’s only real Nobel Prize for Literature winner (for me, the South-African import J.M. 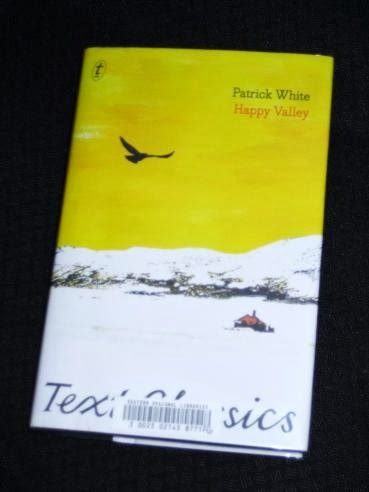 Coetzee doesn’t really count…), and Happy Valley, brought out in the Text Classics series, was his first novel, a book which he refused to allow to be republished during his lifetime. It’s a shame because it’s a great read, an addition to the body of Australian country literature and an ideal entry into White’s work for new readers. In these first few chapters, we meet several pivotal characters. There’s a new arrival, farm manager Clem Hagan, brought in to oversee work on the land of the Furlow family, and Doctor Oliver Halliday, bored of marriage and bored of life in Happy Valley. Among the women, we meet potential spinster Alys Browne, and Sidney Furlow, a local heiress, beautiful and cold. And always in the background, the Quongs, descendants of a Chinese immigrant, shopkeepers and silent witnesses to what happens in the town. The reader, however, is in very familiar territory. Thoughts intermingle, sentences start and trail off, cut down by new thoughts, only half-expressed… It’s not easy to push through at times, but it’s always worth it. Glad you liked it Tony, I must do my Humbooks too. I've done The Murderess (http://wp.me/phTIP-61P) and have bought Kusamakura and The Lost Honor of Katharina Blum so I'm all set to go, just as soon as I finish a couple of others…. When I saw the title, all I could think of for a moment was Happy Valley, Kenya and the murder of the Earl of Errol. I hadn't seen this title before, so thanks for the review. I've been promising myself to read Patrick White. I'm glad you enjoyed your Humbook chosen by Lisa. I'm sure I'd like this but alas, there's no French translation and according to the quotes and my last attempt at reading Australian lit in English, I need a French translation. Which other Patrick White would you recommend? Emma – It's a shame there's not a translation of this one as I think that it would be a great place to start. I've only read a couple of others, and they're both fairly complex works. 'Voss' is his most famous book, but it's not amazingly accessible, from what I recall. I really think Lisa is the best person to ask! Good to know, thanks Tony. Text Publishing actually left out the novel's Gandhi epigraph! It's only alluded to by Craven in his introduction.